Picked up Matt's custom for him at Moonlight this morning. Slate blue spray on the bottom and rails, black and red pin-lines on the deck. Forgot to take a close up pic of the pin-lines. Oops. The usual immaculate finish work by the folks at Moonlight. 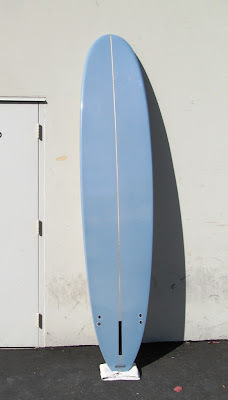 9'2" Point Grinder Model. A no nonsense performance noserider with smooth blended concave in the nose transitioning to a panel vee through the business end of the board. Tucked under edge rails. 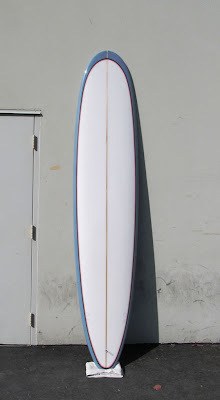 This model is fast and loose and above all, just plain fun to ride.